When designer Lord Leo arrives to give the palace a makeover, Ellie escapes to the stables to avoid all the fuss. Ellie soon discovers that there's something strange about Lord Leo, and she suspects there is more to his plans than meets the eye. 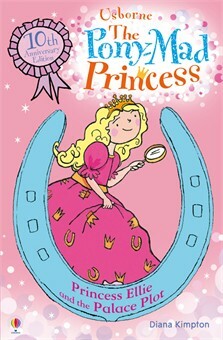 Can her pony, Starlight, help Ellie uncover the palace plot? “Come on, Angel,” said Princess Ellie, patting the skewbald foal’s brown and white neck. Angel’s tiny hooves crunched on the gravel as she walked up the palace drive. Ellie was on one side of the foal and her best friend, Kate, was on the other. Kate made a clicking noise with her tongue and started to run. Angel pricked up her ears, arched her neck and broke into a trot. Suddenly, Ellie heard the sound of an engine. She looked round quickly and saw a bright red sports car racing up behind them. She waved at it to slow down. To her annoyance, the driver just waved back. He didn’t adjust his speed at all. Ellie waved again, more urgently this time. Surely he could see Angel was only a foal. She wasn’t used to traffic. But the driver still took no notice. He gave a long, loud blast on the car’s horn. Then he roared past, waving cheerfully. The wheels of the red car sent up a shower of gravel. The combination of the noise, the speed and the stinging stones was too much for Angel. She jumped away from the bright red monster and nearly knocked Kate over. Then she threw herself backwards, pulling hard on the rope and trying to break free. “There’s nothing to be frightened of,” added Kate, gently stroking the foal’s face. Angel relaxed a little. She stopped trying to pull away, but she was obviously still scared. She was breathing fast, and her neck was damp with sweat. Meg, the palace groom, was sweeping the yard when they arrived. She stopped as soon as she saw them and asked, “How did Angel’s lesson go?” Then she listened with concern as Ellie and Kate described what had happened. “Thank goodness she wasn’t hurt,” she said, when they had finished. Starlight whinnied a welcome and trotted to the gate to meet her daughter. As soon as Kate had unfastened Angel’s headcollar, the two of them cantered side by side to their favourite spot in the shade of the oak tree. Starlight was the largest of Ellie’s five ponies but Angel’s spindly legs were so long that she could easily keep up with her mother. The other four ponies were standing on the far side of the field, swishing their tails gently to keep the flies away. Shadow, the greedy Shetland, was the only one eating the grass. His best friend, Sundance, dozed beside him while Moonbeam and Rainbow stood side by side, watching Angel. She spun round and saw Higginbottom, the butler, standing behind her. She’d been so busy watching the ponies that she hadn’t heard his footsteps on the grass. Higginbottom gave a deep bow. As usual he was wearing his black evening suit and white gloves. She had never seen him in any other clothes and she had never managed to persuade him to call her Ellie. Like everyone else at the palace, he insisted on calling her by her real name. “No one’s told me yet,” replied Ellie. She suddenly felt very keen to find out. But as she ran back to the palace, she remembered the horrid driver of the red sports car. “I hope he’s not the designer,” she thought. She’d already seen enough of that man for one day.